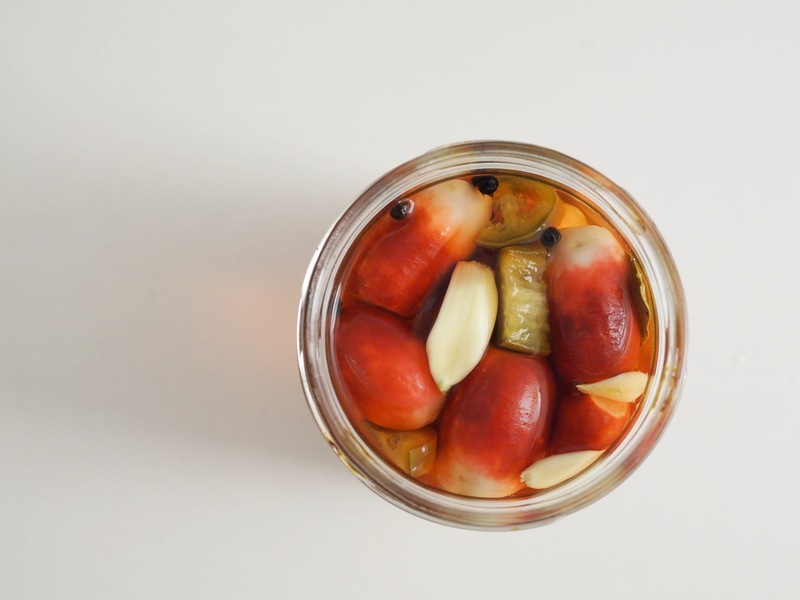 Pickled Radishes — Oh Wonderful! Another Monday has rolled around and to top it off, it’s already the end of March and my 2016 goals are still mostly unaccomplished. But, I have had an extra spring in my step now that the sun has been staying out for an extra hour and a half. These pickled radishes were the first thing I made with my extra sunlight, not that it was a key ingredient in any of this. It was just really, really nice to not feel like I had to crawl into bed within the next 20 minutes. These pickled radishes are perfectly crunchy, savory and just a little sweet with the addition of sugar. Add more jalapenos if you’re craving more heat. If jalapenos aren’t cutting it, try to mix it up with different types of peppers! 1. Bring the water and the vinegar to a boil. Once the water and vinegar reach a boil, remove from heat and stir in the peppercorns, garlic and sugar. Keep stirring until the sugar is dissolved. 2. Wash the radishes thoroughly and remove the stems. It’s up to your here, you can slice the radishes thinly, or leave them whole. 3. Once the radishes are ready to be pickled, place them in a sanitized glass jar and pour the pickle liquid mixture over the radishes. Allow the radishes to cool for an hour, then refrigerate for an hour. Serve with sandwiches, eggs, or salads and enjoy!